...when I got home on Tuesday night he was holding up his front left paw and wouldn't let me give it more than a cursory once over. My neighbour, who's been looking after my pusscats, hadn't seen anything unusual going on, so it was a bit of a mystery. I decided to see how he went over the next day and, as you can see, I made him all comfy with my cardigan and a nice fluffy hot water bottle. Unfortunately, his leg/paw just went steadily worse and by last night he was really limping badly so it was off to the vet this morning. I was, as you do, thinking the worst....broken leg, dislocation etc. Anyway, I'm relieved to say that the vet found a puncture wound and, along with Thomas having a very high temperature, he decided it was a cat bite.....mmmmm....I wonder who the culprit could be?! Methinks that T&T have been taking out their annoyance at me being away on each other! So, he's had a jab that will dose him up over a fortnight and the vet says he'll be feeling much better by tomorrow. This was him a few minutes ago...bless him! .....and a few hours later with my counter getting rapidly filled up! I'm glad to say that everyone seemed to really like my new stamp ranges - always a relief when you bring out a new collection! I really do have the messiest demo table at the show! Just along the way was the DecoArt stand where one of my best friends, Andy Skinner, was wowing everyone with the amazing samples of his work. Round the corner from Andy, Mark Gould was holding make n takes where he was showing people the wonders of the new chalk paints. Here he is, wowing one of the PI team. Some very talented men at this show! So, Sunday came to a close at around 6pm and then it was time for a quick wash and brush up at the hotel before our carvery dinner that was really delicious. Most of us had a reasonably early night and it didn't feel like very long till we were back at the stand again next day! One of the products that I was using was the new Distress Marker Spritzer which creates great effects and is especially useful for working with stencils as it blows the ink very specifically without any seepage to ruin the design. Whilst I was discussing the Spritzer with Neil Walker he wondered how it would work for blowing liquid inks.....no sooner said than done! It blows them beautifully - no need to buy canned air sprays or make yourself dizzy using a straw! Later on I was starting a tag with a background of Dylusions ink spray including one the new colours - Slate Grey which is subtle and gorgeous. I used the Spritzer to blow some of the ink up to create foliage and stamped the leaping hare from my new Hippetty Hoppetty set using the kiss technique with my Zentangle Fillers set. ....naughty rabbits!!! Ooops! Thought you might be amused by my faux pas! Monday evening was our traditional visit to the Chinese Buffet restaurant where we ate lots of delicious food and had a lovely time. Here's me and Monica who looks after the craft stores in the North West of England. 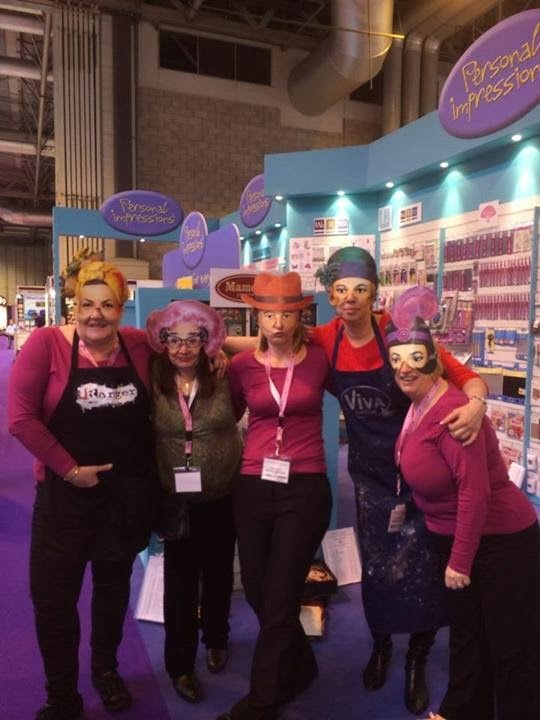 And this is Anke, who was demonstrating Viva Decor products on our stand, Elaine, my best buddy at PI and Andy. ....we had these amazing masks as part of our new Mamelok collection and I have to say that we had quite a few laughs wearing them. Mine was Dame Edna! I didn't get chance to take many photos so I will post piccies of more samples in the next few days. Most of my "stuff" is being posted back to me as, even as a semi professional camel, I couldn't carry everything! Right, the time has flown by whilst typing this - in fact, it was light when I started and now it's dark outside! So, I'd better go and get my dinner and check how my lovely boy is. Thanks for sharing that peek at the show and love and hugs to Thomas! Looking forward to seeing more of your new stamps Lindsay. I must say that we do spoil our pets, your cat just looks so warm and comfortable on the hot water bottle - no over creature can relax like a cat does! The jury is still out over Tara......poor Thomas. Loving the new stamps, in fact I said ooh owls and toodstools and it looks as if you had great fun at stitches which is super !! Big hugs to Thomas ;) Thanks for sharing your busy days at the show. It was great to meet you at the show Lindsay and to attend your workshop - I did love it really - just don't liosten to that Mr S. Hope you've recovered and Thomas too after his poorly leg.